Enhance your digital marketing presence. Drive business development. Showcase your partner ecosystem. Industrial IoT markets are competitive and rapidly evolving. Your online presence must be highly visible to stand out in the market. The IoT ONE IoT marketplace helps companies ensure that your solutions and case studies are easily found by potential customers and partners. A wide range of companies use IoT ONE to source suppliers and technology partners and to educate themselves on technology and use case trends. Let us partner with you to showcase your solutions in a format designed to aid the supplier evaluation and RFI process. Can potential customers find your solutions online? Build your digital marketing presence. in the global IoT ecosystem! Position your company as a market leader! We check your company profile for completeness. We help you creating hardware and software profiles, case studies, use cases, playbooks and guides. Numbers are items per quarter. We calculate a page rank for all companies listed on IoT ONE. Increasing this page rank influences the position of your company in internal search results. Numbers indicate the multiplier of your company's page rank. We feature experts from within your company with a podcast. Numbers are podcasts per quarter. We feature your company in multi-channel digital marketing campaigns including our newsletter. Numbers are features per quarter. Increase your exposure in the rapidly growing IIoT market. "IoT ONE provides valuable insight regarding the IoT landscape on the regional and international scale. IoT is an emerging market, so identifying partners is very important." Google searches fail because decision makers do not know what to search for. Banner advertisements fail to effectively communicate the value of innovative solutions. Traditional sales channels fail to identify the right decision makers due to the IT-OT convergence. Showcase the value of your IIoT solutions with case studies of real world applications. Control your content and avoid bottlenecks in marketing and sales efforts. Support the digital media thought leadership of your brand within the global IIoT community. 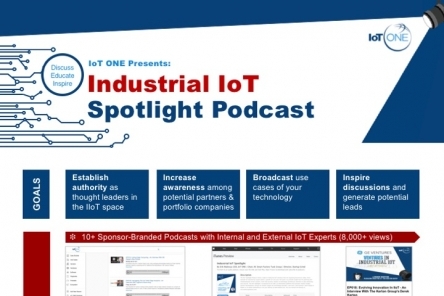 Feature new product launches in IoT ONE podcasts, white papers, and other digital media. Announce your product launches, partnerships and events to thousands of decision makers. Be recognized as an industry leader through regular features in our global newsletter. How can we help you to accelerate your commercial goals?